Our resistance to a Trump agenda and our fight for immigrant rights needs to go beyond the halls of Congress. 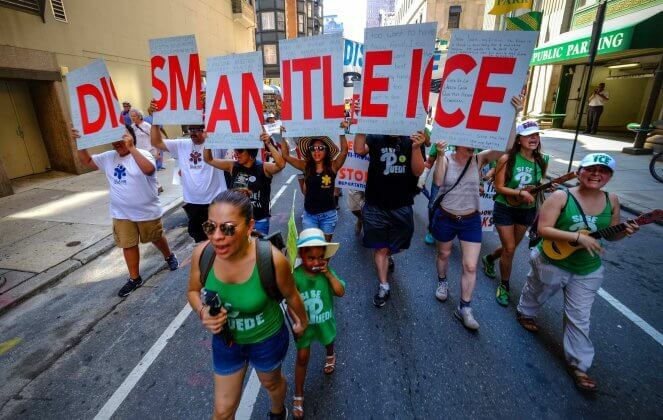 As the White House proposal is exposed as yet another racist puzzle piece in the administration’s ploy to advance white supremacist values, we must strategize to also bring down the two agencies that continue to be a constant threat, detaining, deporting, and incarcerating our communities and those who stand with us: ICE, Border Patrol, and the Department of Justice. We know that the deal proposed by the White House is part of a white supremacist agenda President Trump and his administration have pushed from the start of his presidency. We oppose the deal because it makes targets out of a majority of our family members and because it aims to permanently change the face of the United States into a whiter nation. But we cannot win the fight to defend our communities if we continue to focus exclusively on a congressional strategy. Trump created the current crisis by canceling DACA and TPS, but the white supremacist agenda of the Trump administration is being implemented throughout the government and affecting immigrants everywhere. While the discussions in Congress drag on, ICE, Border Patrol, and the DOJ continue to put into action the white supremacist agenda that we vehemently oppose. Under DHS, Immigration and Customs Enforcement (ICE) and Border Patrol agents have been targeting every member of our community in the streets, in our homes, and at our workplaces, specifically and aggressively searching out undocumented immigrant leaders who speak out about our stories and the injustices of deportations. At the same time, in addition to targeting undocumented workers, the Department of Justice under Attorney General Jeff Sessions is seeking to criminalize city officials who continue to protect immigrants as well as individuals who offer humanitarian aid to migrants at the border. It is time for us to not only refuse to compromise on this deal with the White House, but to also join a strategy towards eliminating the violence and terror ICE, Border Patrol, and the DOJ have been heaping on our communities. This statement was co-written by Mijente along with the Georgia Latino Alliance for Human Rights (Georgia), Puente Human Rights Movement (Arizona), Juntos (Philadelphia, PA), Organized Communities Against Deportations (Chicago, IL), and Northwest Detention Center Resistance (Seattle, WA). 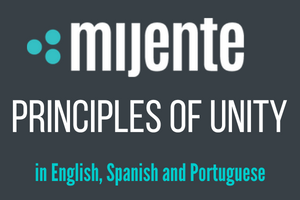 Mijente is a digital and grassroots hub for Latinx and Chicanx movement building and organizing. We seek to increase the profile of policy issues that matter to Latinx communities and increase the participation of Latinx and Chicanx people in the broader movements for racial, economic, climate and gender justice.